CLASSIC: Guided tour of Colmar and the Unterlinden Museum(2). We'll depart for Cologne, reaching it later this morning. Join us on an excursion for both packages: Guided tour of Cologne on foot. Our tour will allow you to wonder at the majestic cathedral, the old town as well as the famous Fragrance Museum (exterior only.) Enjoy time at leisure in the city before we head back to the ship in Düsseldorf by coach. Tonight is our gala evening and dinner. Join us on an excursion for both packages: Guided tour of the open-air museum in Arnhem. 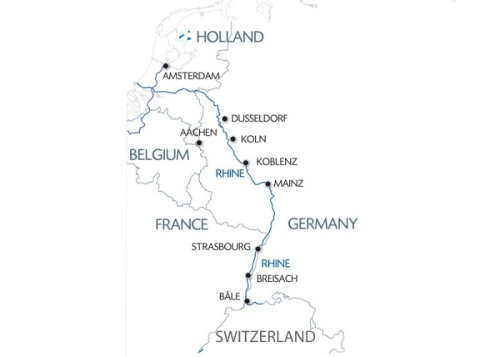 Meanwhile, our ship cruises towards Nijmegen where we'll board it again after our tour. Enjoy an evening of entertainment. In the afternoon, join us on an excursion for both packages: Visit the Keukenhof Gardens(1). Outside the opening dates of the park, guided tour of Haarlem.